Ronald Reagan was an American politician, commentator, and actor. He served as the 40th President of the United States from 1981 to 1989. 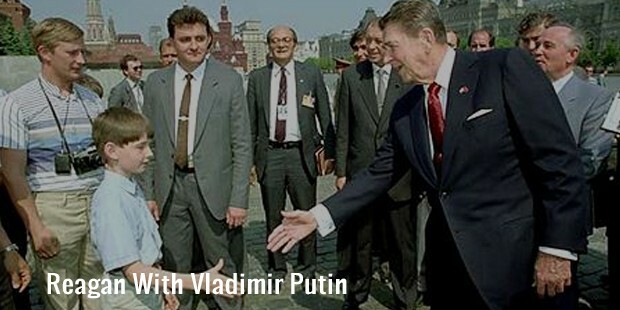 He was elected as the oldest President when he defeated Jimmy Carter in 1980. He began his career as a sports announcer on regional radio stations, later became an actor and eventually became an active politician. He was also twice elected as President of the Screen Actors Guild. 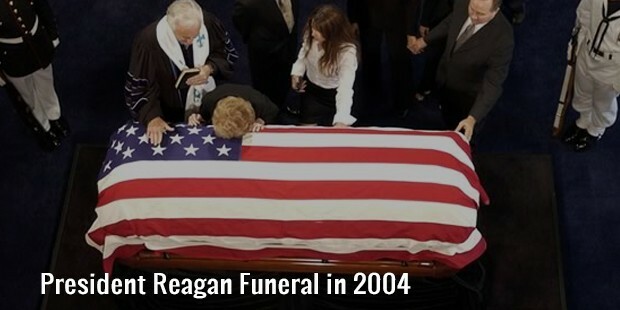 Reagan was diagnosed with Alzheimer’s disease in 1994 and died at the age of 93 in 2004. Ronald Wilson Reagan was born to Nelle Clyde and John Edward Reagan on 6 February, 1911 in Illinois. 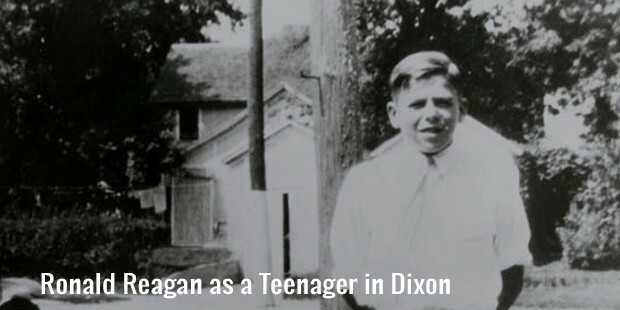 Reagan was nicknamed as Dutch which stuck with him throughout his youth. He developed interests in acting, sports and storytelling while attending Dixon High School. He worked as a lifeguard at the Rock River in Lowell Park. Later he worked as a cheerleader and studied economics and sociology. He excelled in campus politics, sports, theater and was a member of football team and captain of the swim team. He was elected as the student body president. Reagan worked as an announcer at several stations. He worked in Des Moines as an announcer for Chicago Cubs. Reagan signed his first contract in 1937 with Warner Brothers. He landed his first major role in the movie Love Is on the Air in 1939. He played the role of George The Gipper Gipp in the movie Knute Rockne, All American and acquired the nickname the Gipper. In 1942, Reagan acted as a double amputee in the movie Kings Row which was considered to be the best movies by the film critics. Reagan couldn’t enjoy the success of his movie as he was ordered to active duty with the U.S Army at San Francisco just two months after its release. Reagan failed to regain his star status post-war era. Reagan has co-acted in several movies post war including The Voice of the Turtle, John Loves Mary and The Hasty Heart. Reagan was ordered to active duty in 1942 but due to his poor eyesight he was classified for limited service. He served as the liaison officer at the San Francisco Port of Embarkation at Fort Manson. He applied for transfer from the cavalry and in 1942 was assigned to AAF Public Relations. In 1944, Reagan was ordered temporary duty in New York City where he remained until the end of World War II. He was elected as the Directors of the Screen Actors Guild in 1941. Post World War II he resumed his office and became third Vice-President in 1946. He subsequently served seven one-year terms from 1947 to 1952. 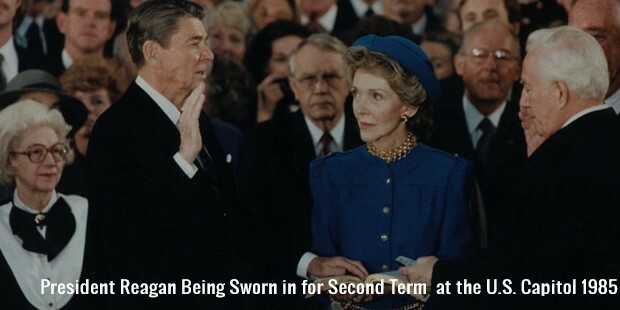 Reagan started his career in politics as liberal Democrat. Reagan served as the Governor of California in 1967 to 1975. Reagan’s policies Reaganomics saw the reduction of inflation from 12.5% to 4.4% and a growth of GDP of 7.91%. He was voted the fifth most popular star by the exhibitors in 1941. Reagan was commissioned a second lieutenant in the Officers Reserve Corps of the cavalry in 1937. Reagan was promoted to first lieutenant and was sent to the Provisional Task Force Show Unit of This is the Army. He was promoted to captain in 1943 after completing his duty. 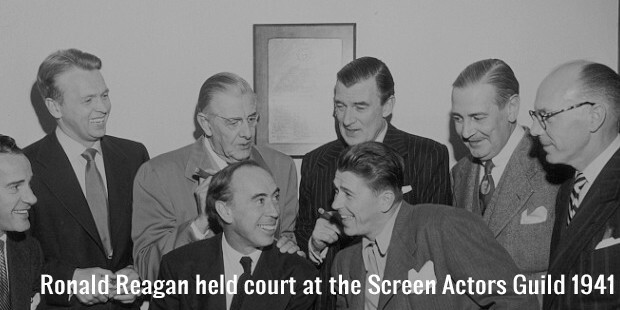 Reagan was elected to the Board of Directors of the Screen Actors Guild in 1941. In 1945, he was stopped from leading an anti-nuclear rally in Hollywood which he later made the nuclear weapons as a key point of his presidency. In 1967, Reagan challenged President Gerald Ford and established himself as the conservative candidate. 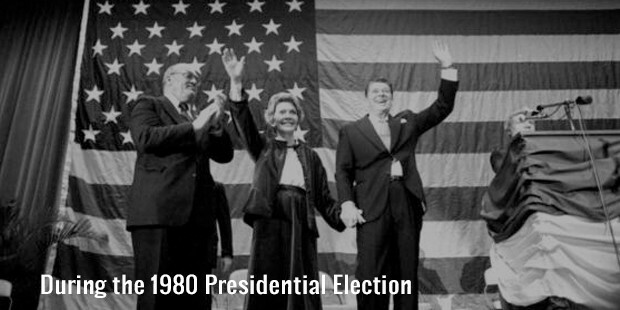 In 1980, Reagan received 50.7% of the popular vote. Reagan proposed a constitutional amendment on school prayer during his first term from 1981 to 1985. During his second term as President from 1985 to 1989 Space Shuttle Challenger proved a pivotal moment. 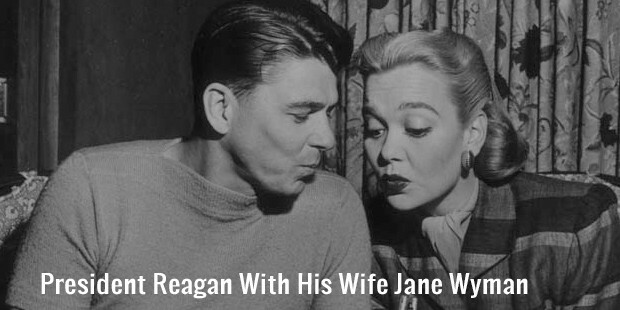 Reagan and Jane Wyman met in 1938 and got engaged in 1940. Together they had two biological children and adopted a son. 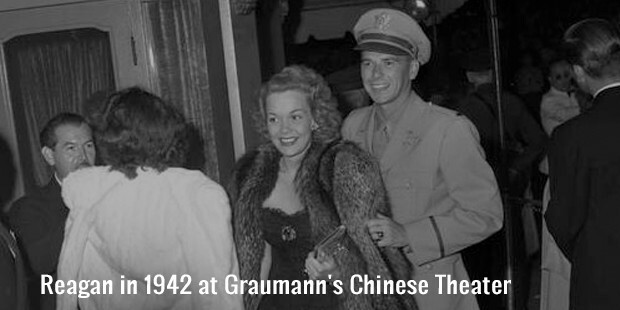 Wyman filed for divorce later in 1948 and finally separated in 1949. In 1940s, Reagan and his wife were believed to provide the FBI with the names of actors within the industry whom they believed to be communist sympathizers. 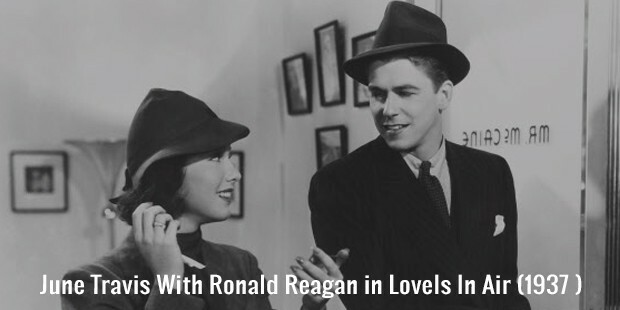 Reagan met Nancy Davis in 1949and got married in 1952. They were blessed with two children. 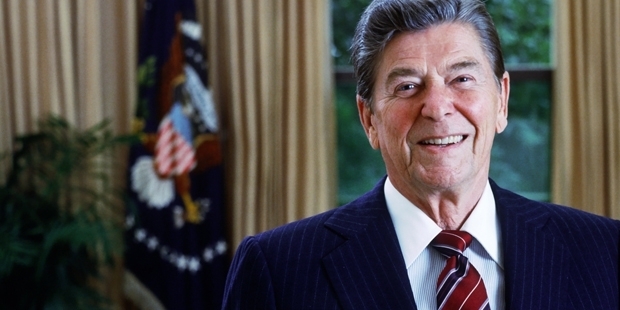 Reagan was diagnosed with Alzheimer’s disease. He experienced occasional memory lapses especially with names. Eventually the disease destroyed his mental capacity. Reagan suffered a fall in 2001 which resulted in a broken hip. Reagan died of Pneumonia complicated by Alzheimer’s disease in 2004. Reagan received a lifetime gold membership in the Screen Actors Guild and was inducted into National Speakers Association Speaker Hall of Fame. He received United States Military Academy’s Sylvanus Thayer Award. He was made an Honorary Knight Grand Cross of the Order of the Bath in 1989. Washington National Airport was renamed Ronald Reagan Washington National Airport in 1998. In 2002, Nancy Reagan accepted the Congressional Gold Medal.